Prompted by some of these ongoing conversations, I decided to do a little initial investigating of my own to see where there might be obvious equity gaps in the context of eLearning at EvCC. The real work of examining equity is difficult and potentially requires multiple types of data in order to get meaningful analytical purchase on its many dimensions. So as a somewhat easier starting point, I posed a fairly simple question: “Are there significant differences between student populations in face-to-face and online courses at EvCC?” Granted, that’s probably a diversity question rather than an equity question–but it creates necessary space for considering those more challenging equity issues in online learning. Once we have a better sense of who might be missing from online courses, we can take up the questions of why they’re missing and how their absence may by symptomatic of systemic inequities. To answer my question, I turned to our institutional Enrollment, Headcounts, and FTE Tableau dashboard (thank you, Sean!) and starting crunching some numbers. I think there is no way we can dispute this. If we wait until the end of the quarter and expect students to provide valuable information on their learning experiences in our class, chances are the disgruntled students (and aren’t there always a few?) will let us know what went wrong. Why don’t students tell us earlier if they want changes made in the course (and I’m talking about classroom activities, not course content)? Because we didn’t ask them. Mid-quarter check-ins are perfect opportunities to get feedback on how things are going. You may be familiar with my all-time favorite, PLUS/DELTA. 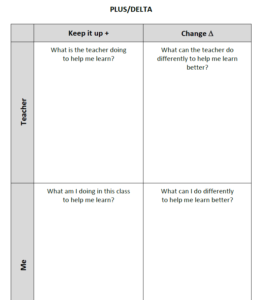 A simple grid with 4 spaces for students to reflect on not only what the teacher is doing to help them learn (PLUS) and what the teacher can change to help learning (DELTA), it also includes spaces for students to identify their own behaviors that are helpful and those that should be improved upon. The most important part of this process is reading and reviewing the anonymous (and I believe it should be anonymous) feedback from students, and then responding, closing the feedback loop. Directions: Please fill out one or both squares and drop in the basket up front before you leave. NO NAMES PLEASE! This is anonymous! This week, what part of the lesson, or what point is still a bit unclear to you? What are you struggling with? And what could I, your instructor, have done/can do to make your learning easier? This week what part of the lesson, or what point, was finally made clear to you? What was your “ah ha!” moment? And/or what did YOU do this week that made your learning easier? Do you have favorite anonymous feedback examples you’d like to share? Let us know! The first time I ever taught a college course, I spent an enormous amount of time grading my students’ essays–many, many hours reading, re-reading, and commenting on their work. Part of the reason grading papers took me so long was obviously my inexperience. I had yet to discover the many small efficiencies that can help speed up the process of evaluating students’ written work. And, of course, being new to teaching I was especially anxious about proving I could do a good job and provide my students with the kind of detailed, constructive feedback that I had received from the teachers who had most influenced and helped me in the past. Stacks and stacks and stacks of grading. Grading by ninniane licensed under Creative Commons. But my slowness resulted from another factor as well. I wouldn’t have been able to articulate it at the time, but I now see I was filled with a vague sense that I might, without knowing it, be unfair in the comments I provided and the grades I assigned. How could I possibly be sure that a student’s tardiness the day before wasn’t subtly affecting how I was reading her essay now? How could I know that I wasn’t thinking about another student’s evident lack of preparation for a class presentation the previous week as I deemed his current work worthy of only a ‘C’? 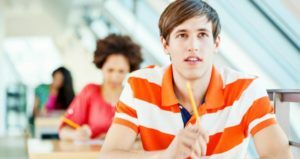 Could I truly guard against all of the various ways in which a student’s appearance or behavior might affect my judgment, even though I knew those things had nothing to do with work I was evaluating now? 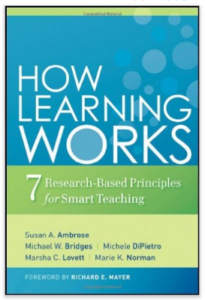 Each month I meet with a group of faculty in the New Faculty Academy to discuss chapters in the book How Learning Works: 7 research-based principles for smart teaching (Susan Ambrose, Michael Bridges, Michele DiPietro, Marsha Lovette, Marie Norman). Our discussions allow us to do a deep dive into our classroom practices, and because the faculty come from different disciplines and teaching experiences, there are always rich conversations that enhance our own learning. Recently we discussed the chapter “What kinds of practice and feedback enhance learning?” There are 2 kinds of feedback that we tend to give students: formative and summative. Many of us rely solely on summative feedback, such as exams, projects, or papers. I recently heard someone describe the case of relying on exams alone as doing an “autopsy” on student work. 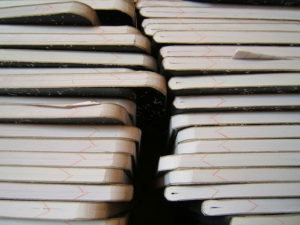 Formative assessment is a way, as the authors state, to focus on ways to help students “work smarter.” The authors believe that “feedback plays” a critical role in “keeping learners’ practice moving toward improvement.” Formative feedback that you might be familiar with would include things like the minute paper or the PLUS/DELTA mid-quarter feedback. Both of these address student learning and allow the instructor to make changes in their classroom practice in real time. Using the minute paper at the end of a class asking students to summarize the main ideas of the day allows an instructor to reflect on whether they were successful in getting those main ideas across. A PLUS/DELTA mid-quarter assessment allows students to comment on what’s working in the class to promote their learning (PLUS) and what changes they’d like to see in the class to help them learn better (DELTA). Of these, I am most interested in knowing whether you have ever used the last type of feedback. Would this be valuable to you, the instructor, and to students? Do you think it would help students to connect the dots between different assignments? If you’d like to learn more about other kinds of formative assessments, please connect with me! I recently had the opportunity to spend some quality time with one of my teaching and learning heroes, Todd Zakrajsek. Todd is at the University of North Carolina at Chapel Hill, where he is an Associate Research Professor and Associate Director of Fellowship Programs in the Department of Family Medicine. I met him several years ago at a multiple day professional development workshop – when I was first finding my way in the Pro-D world – and was immediately impressed by his approach to working with faculty. Just today I received an email from The Scholarly Teacher (one of the T&L blogs I read) and the latest post is by Todd: Students Who Don’t Participate in Class Discussions: They Are Not All Introverts. Take a look – it’s worth your time! 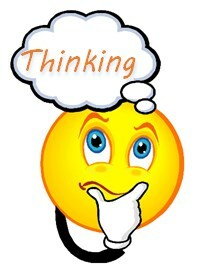 Let me get back to an idea that I have been reflecting on since my discussion with Todd: the Threshold Concept. Here’s how he explains it: many faculty are married to the idea of “I have to cover my content! I don’t have time for active learning because everything is important! I am a content expert! I can get through it only if I lecture!” Other faculty believe that lecture should be punctuated with activities. After 10 minutes of lecture about (name your topic) you should do something active to break up the lecture. It’s something we do to keep students’ attention. Todd suggests that many people, especially our students, have a cognitive capacity that is reached in about 12 minutes. Isn’t that a perfect time to do “some” activity? Yes! But make sure that the activity is designed to solidify that content. Remember, he says, our job is not to cover the material – it’s to uncover the material for students. I know that sounds a bit like it’s coming straight out of a book by one of those educational consultants (believe me, I have plenty of them on my bookshelf!) Pause here for a moment – ask yourself, what do students really need us for? We ask them to purchase (very) expensive textbooks, and most, if not all of the material we cover in a course comes right from that text. Can’t a student who is motivated enough just read the text and “learn” the material? Q1: Your expertise is important, and you were hired to teach in that discipline. If you do not have a background in education, how do you learn how to navigate a class (i.e. how to teach)? Q4: Where do you go to solve teaching problems? How do you recognize when you HAVE a teaching problem? Q5: Interested in learning more about how to identify and solve a teaching problem? Check out The Eberly Center for Teaching Excellence and Educational Innovation. Share your comments and ideas!